Honda CR-Z will be built | What Car? 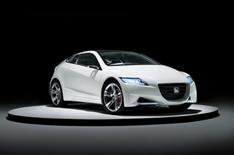 Honda's sporty hybrid CR-Z concept car will go into production, the car maker has confirmed. The hybrid concept car was revealed at the Tokyo motor show in October 2007, and the production version is expected to remain true to the original design. The eco-friendly CR-Z will use a version of the Integrated Motor Assist (IMA) hybrid powertrain that's used for the Honda's Insight and Civic IMA. A 1.3-litre petrol engine, supplemented by an electric motor, an engine stop-start system and eco mode features will help to boost efficiency and generate sub-110g/km CO2 emissions. Sales of the CR-Z will begin in Japan in February 2010, and Honda says that it will announce the UK on-sale date towards the end of 2009. Prices and further technical details have yet to be confirmed. Honda has revealed that it will increase the number of hybrid models it makes. A Jazz IMA will arrive first, but development is under way on a new hybrid system that will be used for larger vehicles. Another production line has already been added at Honda's Suzuka factory to increase production of the Insight, which recently topped the car sales charts in Japan.